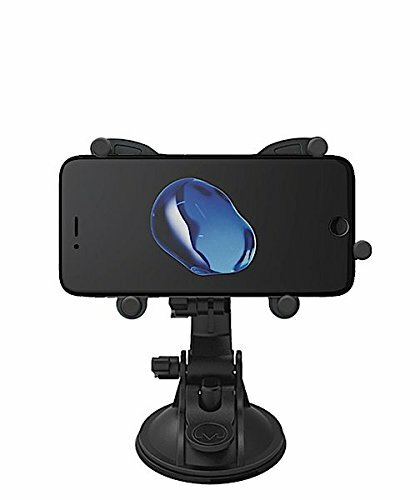 "The Maxx Mount automobile mount (AM-LSP) was designed to hold most standard sized GPS, large sized smartphones or similarly sized devices for mobile use. It offers maximum placement flexibility for installing in automobile dashboard or windshield locations. AMAZON: Fire w/case APPLE: iPhone 6 w/case, iPhone 6 Plus, iPhone 6S w/case, iPhone 6S Plus, iPhone 7 w/case, iPhone 7 Plus ASUS: Pad Phone X, Pegasus, Zenfone Zoom, Zenfone C, Zenfone 2, Zenfone Selfie, Pegasus 2 Plus, Zenfone 2 Laser, Zenfone 2 Deluxe, Zenfone Max, Zenfone Go, Zenfone Zoom, Live G500TG, Zenfone 3, Zenfone 3 Deluxe, Zenfone Pegasus 3, Zenfone 3 Laser, Zenfone 3 Max, Zenfone 3 Delux, Zenfone Go BLACKBERRY: Z10 w/case, Classic, Leap, PRIV, DTEK50, DTEK60 BLU: Energy Diamond, Energy XL, R1 HD, Studio Touch, Studio Selfie LTE, Studio X6, Studio X8 HD, Dash X2, Neo XL GARMIN: Nuvi 30LM, Nuvi 40LM, Nuvi 50LM, Nuvi 55, Nuvi 55LM, Nuvi 55LMT, Nuvi 56, Nuvi 56LM, Nuvi 56LMT, Nuvi 200W, Nuvi 205W, Nuvi 260W, Nuvi 265W, Nuvi 465T, Nuvi 465LMT, iFly 520, Dezl 560LMT(without power adapter), Nuvi 1390LMT, Nuvi 1450LMT, Nuvi 1490LMT, Nuvi 2455LMT, Nuvi 2457LMT, Nuvi 2497LMT, Nuvi 2460LMT, Nuvi 2539LMT, Nuvi 2555 series, Nuvi 2559LMT, Nuvi 2589LMT, Nuvi 2595 series, Nuvi 2599LMT, Nuvi 2599LMT HD, Nuvi 3597LMT HD, DriveLuxe 50LMTHD, DriveAssist 50LMT, DriveSmart 50LMT, Drive 50, Drive 50LM, Drive 50LMT, Drive 51LMT, DriveSmart 51, DriveAssist 51, DriveLuxe 51 GOOD SAM: RVND 5525(by Rand McNally) GOOGLE: Galaxy Nexus, Nexus 4, Nexus 5X, Nexus 6P, Pixel, Pixel XL HTC: Droid DNA, One A9, One E9, One E9s, One M8s, One M9, One M9s, One M9 Plus, One ME, One X w/case, One X9, One A9, Desire 320 w/case, Desire 326G w/case, Desire 520 w/case, Desire 526, Desire 530, Desire 626, Desire 628, Desire 630, Desire 650, Desire 728, Desire 820s, Desire 825, Desire 826, Desire 828, Desire 830, Desire 10 Lifestyle, Desire 10 Pro, 10 Evo, U Play, Butterfly 3 KYOCERA: Hydro Wave, Hydro Air, Hydro View, Hydro Reach, DuraForce XD, DuraForce Pro LENOVO: C2, P90, P70, S60, A5000, A6000, A6600, A7000, K3 Note, K4 Note, K6, K6 Note, Vibe P1, Vibe P2, Vibe X2 Pro, Vibe Shot, Vibe K5, Vibe K5 Plus, Vibe P1m, Vibe S1, Vibe S1 Lite, Vibe X3, ZUK Z1, ZUK Edge LG: Optimus F7, G2, G3, G4, G5, G6, Intuition, G Flex, G Flex2, Joy w/case, Leon w/case, Spirit w/ case, Magna w/case, AKA, G4, G4c w/case, G4 Stylus, G Stylo, Stylo 2, Stylo 2 Plus,G4 Dual, G4 Beat, Bello II, Zero, Nexus 5X, V10, G Vista 2, Ray, K5, K7, K8, K10, Stylus 2, X Screen, X Cam, G5, G5 SE, X Power, X Mach, X5, X Skin, X Style, V20, U MAGELLAN: RoadMate 2210T, Roadmate 2525-LM, RoadMate 2230T, Roadmate 2520-LM, Roadmate 2535T-LM, RoadMate 2620-LM, RoadMate 5145T, RoadMate 5202-LM, RoadMate 5220-LM, Roadmate 5255T-LM, RoadMate 5230T-LM, RoadMate 5235T-LM, RoadMate 5236T-LM, RoadMate 5245T-LM, RoadMate 5255T-LM, RoadMate 5265T-LMB, SmartGPS 5295, Roadmate 5322-LM, Roadmate 5330T-LM, Roadmate RC5370T-LMB, Roadmate RV5365T-LMB, Roadmate 5375-LMB, SmartGPS 5390, RoadMate 5430T-LM, RoadMate 5465T-LMB, Roadmate 620-LM, Roadmate 6220-LM, RoadMate 6230-LM, RoadMate 6615-LM, RoadMate 6620-LM, RoadMate 6630T-LM, SmartGPS 5295, SmartGPS 5390 MICROSOFT: Lumia 540 Dual, Lumia 550 w/case, Lumia 640, Lumia 640 XL, Lumia 650, Lumia 950, Lumia 950 XL MOTOROLA: RAZR series w/case, Droid Maxx, Droid Ultra, Droid Maxx 2, Droid Turbo, Droid Turbo 2, Moto E, Moto E3, Moto E3 Power, Moto G (2014), Moto G (2015), Moto G4, Moto G4 Play, Moto G4 Plus, Moto M, Moto X (2014), Moto X Pure Edition, Moto X Play, Moto X Style, Moto Z, Moto Z Force, Moto Z Droid, Moto Z Play NOKIA: Lumia 928 w/case, Lumia 925 w/case, Lumia 625, Lumia 920 PANASONIC: ToughPad FZ-E1, ToughPad FZ-F1, ToughPad FZ-N1, ToughPad FZ-X1 PC MILLER: Navigator 430, Navigator 440, Navigator 450, Navigator 540, Navigator 550 RAND MCNALLY: Road Explorer 5, Intelliroute TND 510, Intelliroute TND 525, Intelliroute TND 530 LM, TND 525, TND 530, Tripmaker RVND 5510, Good Sam RVND 5525 SAMSUNG: Galaxy S2 w/case, Galaxy S3, Galaxy S4, Galaxy S4 Active, Galaxy S5, Galaxy S5 Active, Galaxy S5 Sport, Galaxy S5 Neo, Galaxy S6, Galaxy S6 Edge, Galaxy S6 Edge Plus, Galaxy S6 Active, Galaxy S7, Galaxy S7 Edge, Galaxy S7 Active, Galaxy S8 w/case, Galaxy S8+, Galaxy Note, Galaxy Note 2, Galaxy Note 3, Galaxy Note 4, Galaxy Note 5, Galaxy Note 7, Galaxy Note Edge, Galaxy Mega, Galaxy Mega 6.3, Galaxy Nexus w/case, Galaxy A3 (2016, 2017), Galaxy A5 (2016, 2017), Galaxy A7 (2016, 2017), Galaxy A9, Galaxy A9 Pro, Galaxy C5, Galaxy C7, Galaxy C7 Pro, Galaxy E5, Galaxy E7, Galaxy J1, Galaxy J3, Galaxy J3V, Galaxy J3 Emerge, Galaxy J5, Galaxy J7, Galaxy J2 Prime, Galaxy On5, Galaxy On7, Galaxy Grand Max, Galaxy Grand Neo Plus, Galaxy Grand Prime Plus, Galaxy Amp Prime, Galaxy Amp 2, Galaxy Express Prime, Galaxy Express 3, Galaxy Xcover 3, Z3 SONY: Xperia C4, Xperia C5 Ultra, Xperia E4, Xperia E4g, Xperia E5, Xperia GX, Xperia M4 Aqua, Xperia M5, Xperia X, Xperia X Premium, Xperia XA Ultra, Xperica XZ, Xperia Z1, Xperia Z2, Xperia Z3, Xperia Z3 Plus, Xperia Z4v, Xperia Z5, Xperia Z5 Premium TOMTOM: Start 50, Start 50M, Go 50, Go 50s, Go 500, PRO 7150 Truck"
Manufacturer: Red Wagon Distribution, Inc. Publisher: Red Wagon Distribution, Inc. Studio: Red Wagon Distribution, Inc. If you have any questions about this product by MAXX MOUNT, contact us by completing and submitting the form below. If you are looking for a specif part number, please include it with your message.